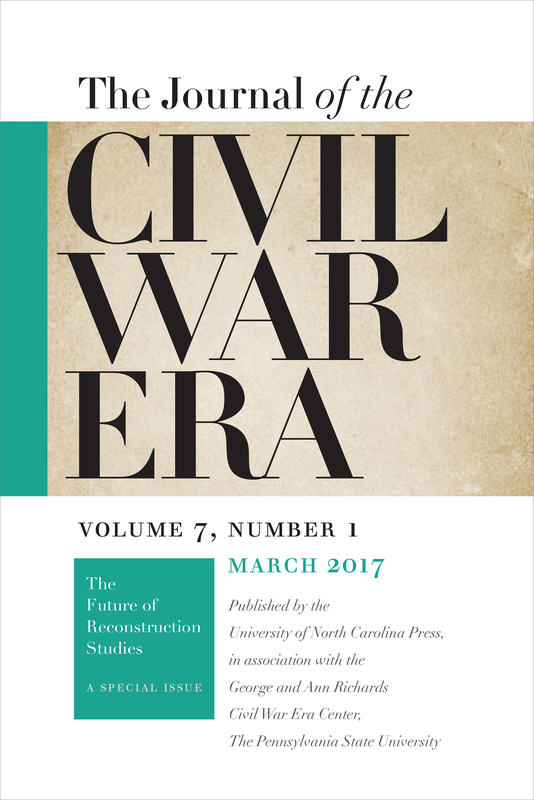 This forum consists of nine brief articles from leading scholars of the Civil War era that outline fruitful future directions for Reconstruction scholarship. Taken together, these articles call for expanding the boundaries of Reconstruction geographically and chronologically to better reflect its transformative impact. They also argue for more interdisciplinary work to uncover previously unappreciated effects of Reconstruction as well as greater engagement with the public to enhance the public’s historical memory of the Reconstruction era. These forum articles are available in their entirety on this site at Forum: The Future of Reconstruction Studies. This article suggests that historical syntheses of Reconstruction unintentionally distort the subject’s rich and varied historiography from the early twentieth century Dunning School to contemporary post-revisionists. Thomas argues that the “American jeremiad” has been the dominant narrative form of synthetic works on Reconstruction, from Claude Bowers’s The Tragic Era (1929) to Foner’s Reconstruction: America’s Unfinished Revolution, 1863-1877 (1988). Predicated on identifying how America has strayed from its path and what it must do to return to its principles and fulfill its promise, the jeremiad highlights a single principle (state’s rights for Bowers, racial equality for Foner) as Reconstruction’s pre-eminent aim. This invites a historical myopia that distorts Reconstruction’s numerous goals, achievements and failures. Thomas calls for a new kind of narrative that will grapple with the possibility that Reconstruction was an “unfinished revolution” because it attempted to achieve many, often contradictory, revolutionary aims. “Reconstructing Memory,” recounts the National Park Service’s unsuccessful effort in the early 2000s to create its first historical site primarily devoted to commemorating Reconstruction in Beaufort, South Carolina. Despite local support for the proposed site and the backing of then secretary of the interior, Bruce Babbit, the effort ultimately failed. The authors argue that the prevalence of a “Lost Cause” narrative of the Civil War and Reconstruction and the concerted opposition of reactionary Confederate heritage organizations like the Sons of Confederate Veterans and the United Daughters of the Confederacy doomed the proposed site. They argue that “the public could not reconcile new interpretations” of Reconstruction proposed by the NPS “with its own historical memory,” which continues to be shaped by texts like Mary C. Simms Oliphant’s Simms History of South Carolina, which takes a dim view of Reconstruction. Whitmer and Taylor conclude that historians must endeavor to “disseminate modern scholarship into the public sphere” to expand the public’s historical memory. This article calls for a fresh conversation about how educators teach Reconstruction to undergraduate students. For Rosen, Reconstruction provides an ideal framework for engaging students on the complex topics of race and racism and to teach “how constructs of race have been produced and reproduced across time and the work these constructs have done to perpetuate and justify inequality.” To take advantage of revivified scholarship on Reconstruction, she recommends dividing the traditional two-semester US survey into three semesters, in order to give the subject sufficient attention. Courses designed thematically around such topics “as race, citizenship, violence, capitalism and labor, or criminal justice and incarceration” can better allow educators to highlight the many lessons Reconstruction has to offer. Rosen’s hope is that students will recognize that conflicts surrounding what it meant to be free have bearing on current civil rights initiatives and the “still unfinished story” of Reconstruction. This roundtable discussion of Reconstruction in public history and memory took place online between May 2 and May 22, 2016. The participants, representing a broad array expertise in the field of history, debated and discussed the educational opportunities and challenges presented by the ongoing sesquicentennial of Reconstruction. Topics of discussion included how to redress the public’s limited familiarity with Reconstruction, how to come to terms with terrible violence that attended opposition to Reconstruction, and how to frame Reconstruction in ways that allow us to relate its lessons to contemporary social problems.